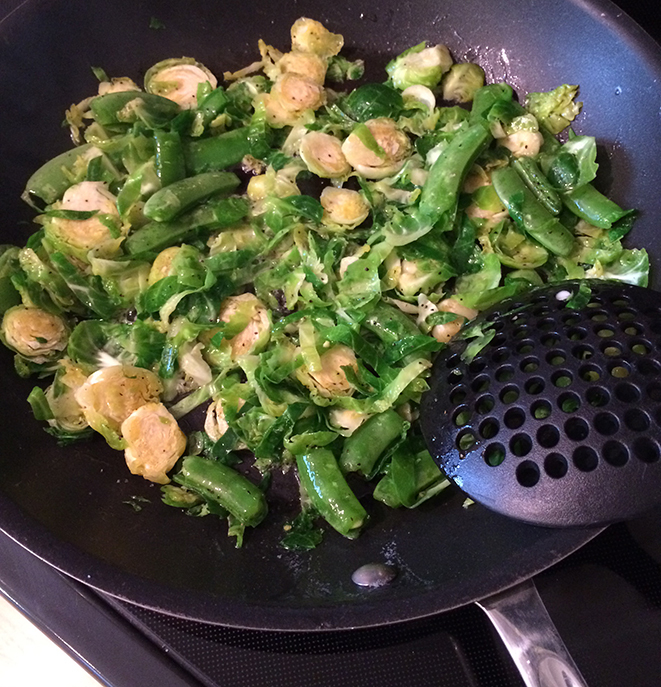 Our daughter-in-law Jenny Simmons introduced us to stir-fried Brussels sprouts. I have steamed and roasted these miniature cabbage-like vegetables, but never tried stir-frying them until Jenny prepared a skillet of shaved Brussels sprouts mixed with walnuts for a recent birthday dinner. Pair shaved Brussels sprouts with sugar snap peas for an all-green vegetable side dish. You can carefully slice each Brussels sprout head into thin slivers or buy them already sliced, shaved or shredded from a farmers' market. Looking ahead to St. Patrick's Day, I experimented with several green vegetable stir-fry combinations to serve with potatoes and Irish stew (for the meat eaters in the family). My favorites were a combination of broccoli florets and sugar snap peas and Brussels sprouts with sugar snap peas. Quick, convenient and delicious, do try. 1. If you weren't able to buy pre-sliced or shaved Brussels sprouts, careful prep the miniature cabbage heads into stir-fry sizes. Prep sugar snap peas by cutting off the ends and removing the tough string that runs down the side. 2. Heat olive oil in a large skillet. Toss in Brussels sprouts and sugar snap peas and stir to coat with the hot oil. If you like a creamier stir-fry, add a pat of butter to the vegetables as they cook. Season and cook over medium high heat until vegetables are hot but still firm. Serve immediately.